Guest Blogger: Abi Elphinstone #YASHOT tour! My Mum is a big reader and she introduced me to Sylvia Waugh, Alan Garner, Gillian Cross and Anne Fine. Those stories sent my mind spinning with dolls that came to life and demon headmasters and when my Dad took me adventuring – up onto the moors, through silver birch forests or into remote seaside caves – I started imagining the magic in those places and conjuring up stories of my own. And, perhaps the most memorable thing of all: my parents read to me every night before bed and the sense wonder I felt then as I heard about trolls, dragons and far away castles has stayed with me ever since. I grew up in the wilds of Scotland. I could tell you where the golden eagle had her eyrie on the moor, I could show you where the salmon leapt in the North Esk River and the best spot for picking chanterelle mushrooms. But I had absolutely no idea where the nearest chemist, post office or supermarket was. I did know where the library was though – because it was there I discovered Roald Dahl. Brechin library was my nearest and I used to go back and forth each week to get every single Dahl book out. It made me smile recently when my brother named his first daughter Matilda and after one week of her being in our world, he got her a library card. Books are like Portkeys. A single sentence can transport you to another world. You could be sitting with a pile of homework in front of you or a mountain of unpaid bills and then within a few words you’re riding a polar bear in the Arctic or sitting in a potions class at Miss Cackle’s Academy for Witches. And stories teach us to be brave. I was shy as a child and when I read about Lucy Pevensie, the youngest of her siblings, pushing open that wardrobe door, finding Narnia and setting out to beat the White Witch I felt filled with courage. Lyra did that for me too – she taught me that girls are as brave, sometimes braver, than boys and that adults don’t always have the answers. How has reading influenced your own writing? Almost everything I read influences how I write, from books to news articles, signposts to cocktail lists! I’ve found stories and characters ideas in them all. Michelle Paver’s books taught me how to write action and build suspense; as a result, the chapters in my debut, The Dreamsnatcher, are short and packed with drama. Katherine Rundell, Frances Hardinge and David Almond showed me how characters don’t need to conform – and my main character Moll’s slightly ‘off the wall’ nature is down to reading their books. 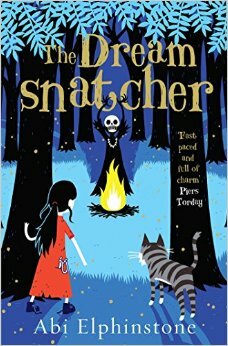 JK Rowling taught me to world-build and that children can handle ‘dark’ – I’m sure the Dreamsnatcher would be great pals with Voldemort… And I learnt about the subtlety and strength of child-animal bonds from Philip Pullman’s Lyra and Pantalaimon. Here on GHB we love recommendations from authors about books they’ve read. What would you like to recommend to our readers? Ooooh, I love this question. For children wanting fast-paced and brilliantly evoked adventures, I’d recommend Michelle Paver’s Chronicles of Ancient Darkness series, or Rob Lloyd Jones’ Wild Boy series. For those who love animal adventures, Piers’ Torday’s The Last Wild series is vast in its themes and boasts some truly unforgettable characters. Anything Katherine Rundell writes is exquisite, especially The Wolf Wilder (the heroine made me want to stand on my chair and whoop) and both Emma Carroll and Jane Hardstaff write wonderful historical fiction. Thanks so much, Abi! Have a brilliant day at YA Shot, and maybe you’ll see some of our GHB readers there! If readers want to buy tickets, click here for all the info! Watch The Dreamsnatcher trailer here. Tags: Abi Elphinstone, Hillingdon, YA Shot. Bookmark the permalink.